The use of solar energy ranks among the most environmentally responsible energy conversions imaginable. In addition, the government is currently committed to investing in these kinds of systems. For the latest information on subsidy programmes, contact your local heating contractor or refer to the product information section on this website. Thanks to freely available solar energy, detached or two-family houses with a solar thermal system can now save up to 35 percent on heating costs in if using solar collectors both for central heating backup and DHW heating. This can cover up to 60 percent of the annual energy demand for DHW heating. Heat is generated by a gas condensing boiler and is distributed throughout the interior either by radiators or underfloor heating. In addition, a solar thermal system with an approx. 5 m² absorber area is used for DHW heating. The living area is approximately 140 m². The use of solar energy ranks among the most environmentally responsible energy conversions imaginable. In addition, the state has involved itself in investing in these kinds of systems. For the latest information on subsidy programmes, contact your local heating contractor or refer to the product information section on this website. Thanks to freely available solar energy, today you can save up to 35 percent on heating costs in detached or two-family houses with a solar thermal system if you use the solar collectors both for central heating backup and DHW heating. It can cover up to 60 percent of the annual energy demand for DHW heating. Condensing boilers from Viessmann are already prepared for the use of LPG. A solar thermal system offers greater independence from fossil fuels. A solar thermal system is the perfect addition to any heating system: It can be used for DHW heating and central heating backup in spring and autumn. Bank on leading technology: Viessmann&apos;s advanced and highly efficient gas condensing boilers make it easy to keep warm and relax. 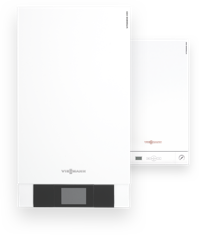 Viessmann offers both floorstanding and wall mounted gas condensing boilers that achieve efficiency levels of up to 98 % in turning fuel into energy. Wall mounted gas condensing boilers are perfectly suited to be installed near the living space on account of their compact dimensions and quiet operation. The stainless steel Inox-Radial heat exchanger combined with the MatriX gas burner, ensures high energy efficiency and a high level of heating convenience for the long term. At the same time, this technology reduces heating bills and minimises emissions. Thanks to the automatic Lambda Pro Control combustion controller, Viessmann gas condensing boilers are already designed to meet future standards, as they can operate with different gas types and biogas mixtures. Consequently, they represent a futureproof and cost effective solution.